The historical landscape is littered with dead civilizations, and this suggests the historian is to some degree a pathologist. Besides describing the character, res gestae and organization of societies, historians must account for the manner of their collapse, and seek for pathogens common to the demise of them all. Thus Gibbon hypothesises the "triumph of barbarism and religion" as the cause of Rome's doom; Spengler in his Decline of the West equates civilizations with organisms, both being subject to the same inevitable decay; Toynbee argues that societies break down when their ideologies cannot accommodate invasive moral or religious practices; while Kennedy speculates (in The Rise and Fall of the Great Powers) that great states expand to a stage where they become financially and militarily overstretched (a historian's version of the Peter Principle). Would you choose to read this book based on these blurbs? Against my votes, our book club did. My only hope was from a brief (and ironic) statement that said Jacobs wrote with an "elegant, plain-language prose." Needless to say, I was intimidated, especially by that jargon-filled, fact-spewing crap Books In Canada tried to pass off as a review. Fortunately Nicholas Maes did not write this book, and it's easy to follow. 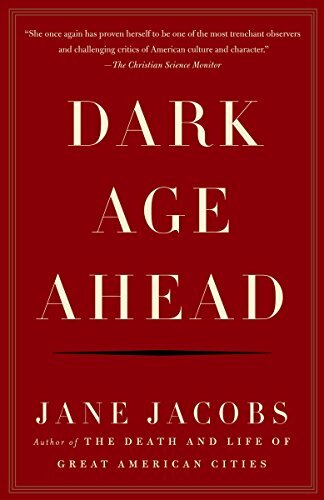 Jane Jacobs presents her case as to how we've gone wrong as a society and are currently at risk for living in a cultural abyss known as a "dark age". It's intriguing stuff and backed up with examples that seem eerily close to historical precedents of past dark ages. So far, however, it's a little too pessimistic for my liking. When she talks about the automobile industry haven taken over North America and its dire consequences for our culture, it's almost as if she's dropped the "Ahead" part of the title and is insisting that it's already too late. To be fair, I'm not at the end yet and maybe it'll turn around. I am enjoying it. As I've said before, it's written in a clear, accessible manner and as Maes proved, that's not a small feat considering the topics. Also, while Jacobs seems to be focused on a broad western hemisphere culture, I've found myself considering Newfoundland and Nunavut. At times, it seems as if people are placing bets to see who will lose their culture the fastest and I'm hoping Jacobs' book will help shed some light. Finally, reading books such as these make me feel somehow more responsible. I know that probably sounds cheesy and even moronic if I'm not prepared to act afterwards. However, when I read so much fiction, it's nice sometimes to take the time to reflect on the state of the world, even if I don't agree with everything the author has to say. japplaud your book club for tackling this. I've always found Jane Jacobs to be a rather interesting personality and with her recent passing, I think this is an ideal book to read. I may take a run at it myself. I hadn't heard of her before. But that's a good thing- it's one of the reasons I wanted to be in a book club in the first place- exposure to new authors.